now bring the best of productivity, games and more to your desktop. The Chrome App Launcher is available for Windows and Chrome OS, and today we're unveiling the launcher for Mac OS X on the Chrome Developer Channel. 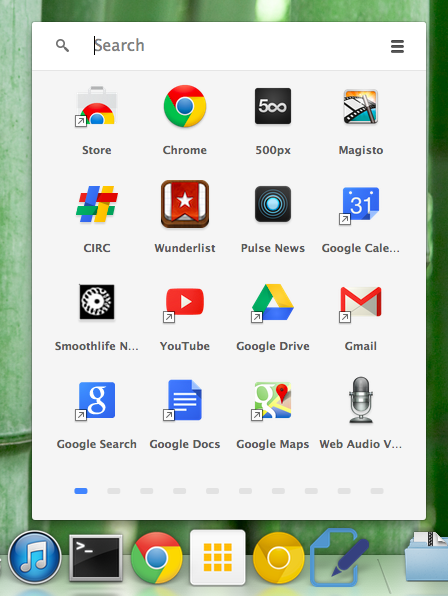 The launcher provides an easy way to find and launch your Chrome Apps, while at the same time integrating closely with the operating system so that your Chrome Apps behave and feel just like regular native ones. For example, on Macs you can find your Chrome Apps in the launcher, Applications folder, in the Dock and when you do a Spotlight search—just like any other Mac app that you already use. To get the launcher, just install a Chrome App from the Chrome Web Store, such as this text editor or note-taking app. The first time you install an app, the launcher will show up as an icon in the Dock. Chrome Packaged Apps for the Mac are available in the dev channel of Chrome and will be launched to stable channel soon. In the meantime, you can build your own packaged app, upload it to the Chrome Web Store and give all of your users access to it via a direct link. Have questions about this or any other Chrome Apps features? We always welcome your feedback on Stack Overflow, our G+ Developers page, or our developer forum. Chrome Apps now bring the best of productivity, games and more to your desktop. The Chrome App Launcher is available for Windows and Chrome OS, and today we're unveiling the launcher for Mac OS X on the Chrome Developer Channel.